Snorkeling for the first time can be a daunting experience. You may dream of floating effortlessly in the clear blue ocean but when it actually comes to getting wet, it can be a bit scary and disorientating. Don’t worry this guide will help you take to the water like a duck. We don’t just want this guide to be for absolute newbies so we have sections for Novice or Rusty Snorkelers, and advice for more experienced snorkelers who are maybe just new to Hawaiian waters, and even Pro’s. Our Hawaii Tips Guide should have something to take away for everyone thinking of taking the plunge in Hawaii’s stunning aquatic landscape. Have you read our Saftey Guide? And the Hawaii Government Saftey Guide? No? Well, go read them first. Can You Swim? How well? Your swimming ability is always the first thing to address. If you are unable to swim or very weak then snorkeling outside your own depth, as in where you cannot stand up is a very risky proposition. Unfortunately, there are very few placed where snorkelers can see much in Hawaii and remain in their own depth. For non-swimmers, we would probably suggest rethinking the decision to go snorkeling in Hawaii. Weak swimmers could consider one of the snorkeling tours on offer as these will deposit you right onto the reef and offer the all-important surface cover/lifeguard who can help you out if you get into difficulties. Just mention it to them beforehand. Snorkeling and swimming are very different activities but while snorkeling it is almost inevitable at some point you will have to swim. In some instances, this can be a very short distance but it is going to happen at some point. And you need to be ready for this and able to cope with a surface swim. Choosing the right site is essential. 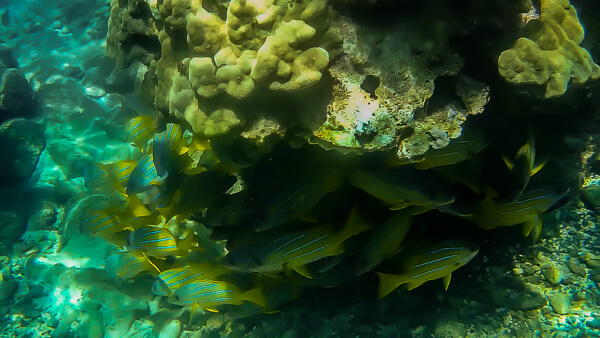 Hawaii’s best snorkeling takes places in slightly deeper water around rocky outcrops where coral can take hold. As such most beaches have very little to see. You need to head out to the reefs to get the best snorkeling and wildlife. Obviously, for beginners and weaker swimmers, this is problematic. Fortunately, there are few perfect sites where beginners can take their first few steps into the snorkeling world. 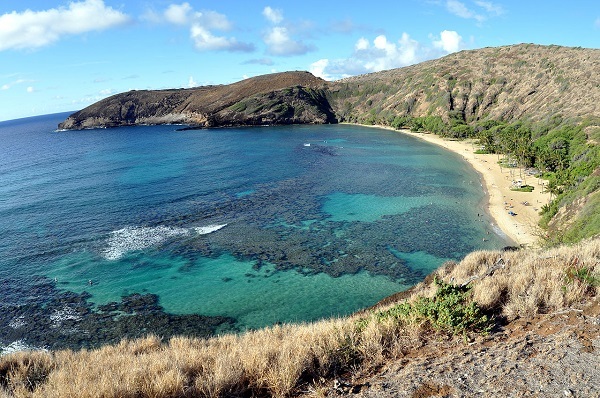 Oahu – Hanauma Bay is excellent for first-time snorkelers. The Bay is enclosed and far less susceptible to large swells than anywhere else on the island. There are multiple soft sand entries where you can walk right in and then gently float out to the extensive reef. It is a good place to snorkel in general but for beginners it is perfect and the extensive marine life could get you hooked for life! The Bay is also a stunning place to visit in general and has great facilities including rental gear and lifeguards. there is a $7.50 entrance fee, however, but it’s well worth it for a wonderful half day trip. 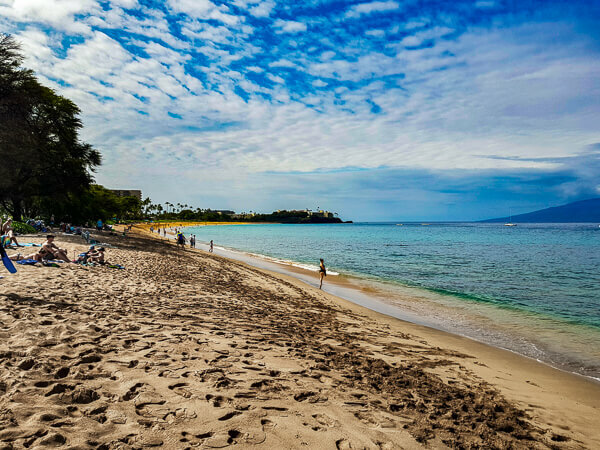 West Maui – Airport Beach is definitely the best spot in West Maui to try out snorkeling. Assuming its calm, which it often is. If the waves are lapping the shore gently you are good to go. At Airport beach the reef is very close to the shoreline. only 10-20 feet out and you are on top of the reef and the water is usually pretty clear, and the wildlife reasonable. Be aware though there is often a current, however, it runs along the beach so will just sweep you down the beach. Just make sure at all times you can easily reach the shore. Kapalua Bay is also a good site as the bay is very protected with almost no current, it does require a little more swimming than Airport beach would. South Maui – The best beaches in South Maui are any of the Kamaole Beach Park’s (I,II,III) these are shallow and often calm. If there is any surf save it for another day. The best snorkeling is at either end of the beaches around the rocks, in the middle, you will just see sand. The plus points of these beaches are they are manned by lifeguards so help will be at hand if you get into trouble. Your Snorkel gear is very important. Good gear makes a world of difference over cheap ill-fitting rubbish. We have a full guide here. 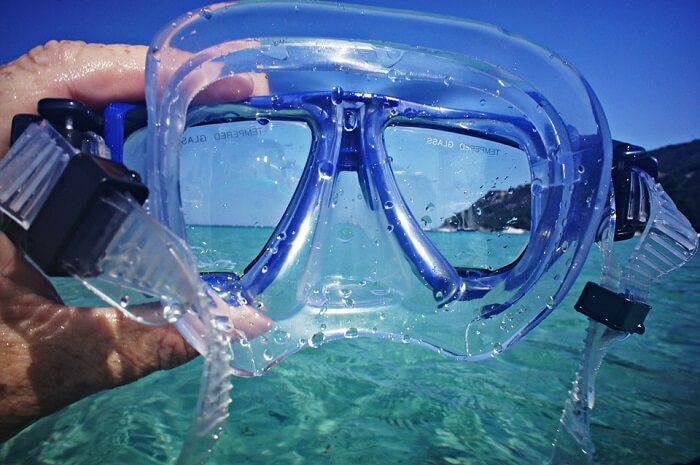 But we also recommend for your first couple of snorkels to ditch the fins. They are an unnecessary hassle. If at all possible try out your gear in a pool. You might look a bit silly but it’s better to look a bit silly here than out in the ocean. If you don’t have access to a pool, at least try the gear on several times. Masks can feel claustrophobic and breathing through the snorkel can take some getting used to. This is all best practiced in the safety of dry land or confined water. When finally at the Ocean take everything slowly do not just charge in. Even in Hawaii’s balmy waters on hot days they will still feel cold initially so enter gradually on a soft sand area. Slowly submerge yourself up to your shoulders in water well within your depth. Then experiment ducking your head under and looking around. Get used to breathing, the noise, the restricted vision, etc… There will be little to see. So just get used to it all. Finally, allow your body and legs to lift up in the water and float. Just float around getting used to the whole sensation. Then begin gently swimming, just practice movement first before heading off to where the life may be. Moving through the water should be a nearly effortless process. With your body parallel in the water, minimum input from you should propel you forwards. A light kick and a breaststroke style arm pull should be enough to move a meter or more. The idea is: stroke…glide…observe…repeat. There may be times when a more concerted swim is needed to get somewhere but on the whole, you are just floating, observing and relaxing. At all times you should be relaxed. If at any point your heart rate or breathing start to raise, just stop doing anything and float. Enjoy the weightlessness and the stunning undersea world. added buoyancy can really help build your confidence. The whole concept of surface snorkeling is floating along on the surface. Having a bit more float can only help. This can inspire confidence and reassurance but it is no means necessary as a human body in salt water will naturally float. But if it helps build your confidence it can be a good idea. WARNING! – The problem with Buoyancy aids id reliance on them. We tend to recommend very cheap items, which can fail. Noodles can slip out from under you and blow away. If you are reliant on them…then what? As ever ensure you can EASILY get back to shore at all times, with or without any floatation aids. Assuming you listened to our Gear Guide and bought a snorkel with a splash guard and a purge valve this is no problem at all. As you are only snorkeling in calm waters, as you are still a beginner, then water should never get into the snorkel. But there can never be any guarantees. and if you do get water in it can be very unpleasant and quite shocking. It should be no big issue, however, When surface snorkeling your head is never more than a few inches away from the surface. So whether you have a purge valve or not it is no problem to just spit out the mouthpiece poke your head up and grab a few breaths. Alternatively, if you do have a Purge Valve a good hard, fast blow will purge the water from the snorkel and allow you to breath again. Chances are on your first snorkel you will not see too much, however not too much in Hawaii is actually quite staggering by most standards. 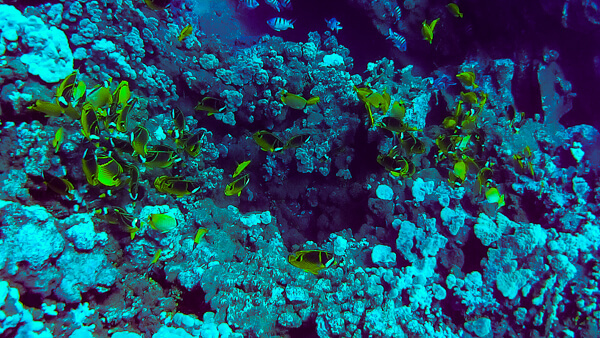 Check out our Hawaii Reef Fish Guide and there is a good chance you will spot many of the “Every Snorkel” Fish. They are incredibly abundant and even in shallow water very close to shore, you have a good chance of seeing large numbers of fish. You easily might see a Green Sea Turtle too as, well, they are everywhere! Also, check our snorkeling safety page for advice on critters you will want to avoid, jellyfish, Sea Urchins, sharp coral, and rocks are your biggest dangers. When you are still a complete beginner mask clearing can be an issue. Removing you mask is not something we wholly recommend while out of you depth. Getting it back on can be tricky. While still learning the best solution for mask problems, be it a leaky mask or fogging up is to head back to shore and rectify the issue there. Congratulations you are no longer a complete Beginner, you have successfully Snorkeled and can Advance to Novice Rank! As you may have skipped the Total Beginner Section, remember to start off with our Safety advice Page. So you have snorkeled a few times before, maybe in Florida or the Caribbean? or you have snorkeled a few years ago but are a little rusty now. This section is designed to help you get up to speed with snorkeling in Hawaii and how to get the best out of your adventures. 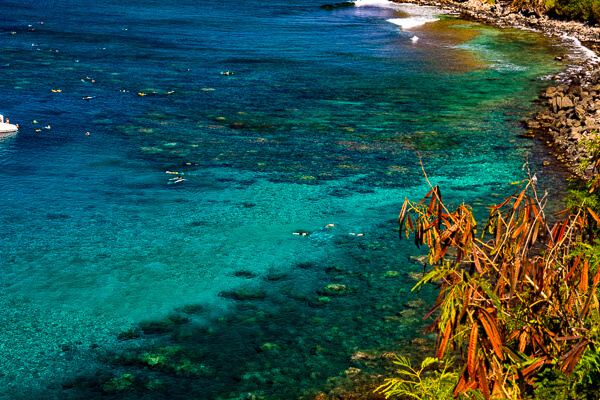 The majority of Snorkel sites in Hawaii are suitable for fairly novice snorkelers as long as the sea conditions are calm. You should always take heed of our safety guidelines and never exceed your comfort zone but with just a few exceptions most sites are fair game. We would start at the easier sires and maybe progress to the medium ability sites as your confidence grows. But remember a lot of Hawaii’s best site might be more exposed than some places you are used to. When sites are exposed to the open Ocean Big swells and choppy seas are a persistent issue. 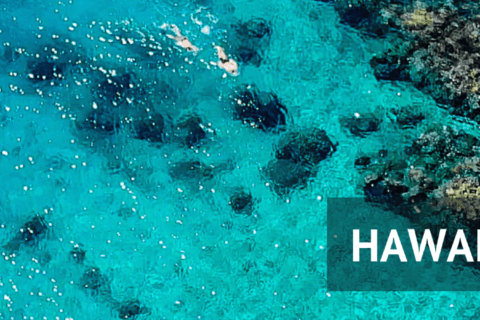 Check our Oahu and Maui Snorkel Sites guides for more info. As we discuss in our Safety Guide, Your swim ability is one of the major factors in how far you should push your exploration. We do recommend knowing your swimming ability if you want to push further out to sea and explore the more remote reefs. We always consider the one-third rule to be safe. That is knowing how far you can comfortably swim in one effort, and never venturing more than one-third of that distance. This might take a bit of re-acquaintance in a pool before you leave to see just how far you can swim and use this a basis. Now Snorkeling is not the same as swimming and while gently floating around the bay or reef you may cover many times this distance. This is fine but you should remain at all times within one-third of an exit point. This is in case for some reason you do need to get out quickly. The one-third portion accounts for any change in circumstance such as current or rougher conditions. It giving you a BIG comfort zone. It is also more often than not more than enough. If you can manage 400m at a pool (8x50m or 16x25m pools) then you can venture over 130m away from the exit point, that is plenty for most sites and 400m is a very modest amount to swim in one go, especially taking it easy. Essentially knowing your limits and staying well within them. We said in our beginner section to not bother with fins. They are an unnecessary distraction. 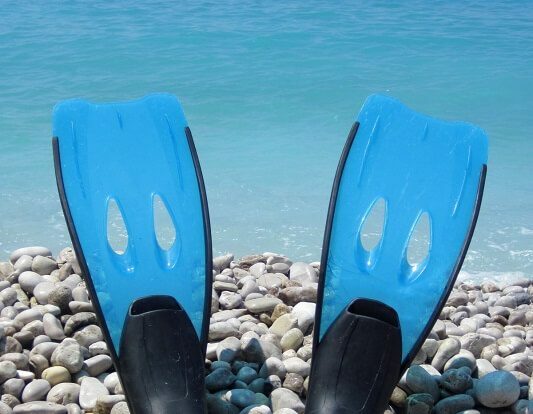 But once you have had a snorkel or two then upgrading to fins is a definite plus. The ability to move around exploring the reef with almost no effort other than a gentle kick is well worthwhile. This also replaces the need for any Arm stroke which reduces splashing and is less likely to startle or scare sea life away. Instead, you cruise in silently and unannounced. They really transform the experience from swimming with a snorkel to real snorkeling and being at one with the ocean. They are also seriously useful if you want to start diving under the surface, which we will take a look at now. The only way to get down and take a closer look at the sea life is to submerge yourself head first and dive down under the waves. Once down you are now in a completely different world. freed from the confines of Gravity you are free to explore the undersea world with all the freedom of a fish, well nearly. Until of course, you run out of air. The first thing you will notice is how clear everything has become. The surface layer is often cloudy and murky and obscures the view slightly, once under this layer visibility is vastly improved. However, it will not be long before you need to resurface as you run out of air. If you venture past 2-3 feet you will begin to notice the effects of water pressure. You mask will be pressed firmly against your face and you will begin to feel pressure in your ears, as you go deeper this ear pressure will become painful and soon it will be unbearable. At this point, you will need to equalize. This is done by pinching your nose and breathing against this. This increases the pressure on the inside of your ears and equalizing the pressure and relieving any pain. By now you are getting to pretty advanced Free Dive Techniques and there are safety implications of your actions and some more formal training may be appropriate. PADI offers a host of Free Diving Courses you may enjoy and benefit from. As you get more confident in the water you may want to head further out. To outlying reefs that are inaccessible to beginners. This is perfectly acceptable but alway keep in mind the one-third rule. It is essential when venturing further afield to keep effort very low. Especially on the way out. This keeps your heart rate low and leaves more room before stress and panic attacks can take hold. Everything should be very easy. If you are in an enclosed bay like Honolua or Hananuma then as long as you are within the confines of the bay there is very little to fear. However, if the area is more exposed to the open ocean waves and chop can increase quickly and out of nowhere as you leave the protection of the shoreline. The point of venturing further away is not to just get as far out as possible but to access more remote reefs that “may” contain wildlife not found closer to shore. Larger pelagic species such as Tuna and Trevally, along with eagle rays. Only head for a reef if you know it’s there, there is little point swimming endlessly over empty sand unless you know there is a destination. These can easily be spotted on Google Maps and confirmed by seeing a dark patch in the water from shore. The desire to explore can be strong but it not always the most productive and often the riskiest. We tend to prefer to follow walls and rocky outcrops as they head out into the deep. These often provide the best life and give the protection from chop and the comfort of still being close to shore. Being away from beaches also means the water is not colored by the sand. Shallow reefs are a fascinating place to explore as the coral growth is fantastic. However, at times these can be maze-like and hard to penetrate and hard to get back out of. Care must always be taken not to touch the coral. Partly as it’s sharp and capable of inflicting nasty wounds, especially is a swell is bashing you around a bit. Mainly though this is to protect the Coral. Touching or walking on Coral can simply kill it. Even you guys are not immune to our preaching, Snorkeling can be dangerous. Check out our Safety guide page first. You are in Hawaii Now! For Experienced Snorkeler there is not too much we can tell you about Snorkeling, We are not “pro” and probably put ourselves in this class so we can’t really teach you anything about the sport itself, However, we are well versed with the conditions and sites of Hawaii itself. The one thing we can tell you is the Snorkeling is Epic. Having Snorkeled in hundreds of places world over Hawaii is still up there as some of the best. The diversity and density of life is wonderful. The Coral is a little on the dull side, only a few species have managed to find the way to this remote island chain and they are all basic sturdy light brown species. But the growth is still very healthy on many of the reefs and it supports an incredible array of life. Turtles are everywhere, nearly every bay, beach and reef has a resident population and these stunning gentle creatures are a pure joy to share the ocean with. On top of this, there are huge numbers of colorful reef fish, Bright red Pencil Urchins, Starfish, Shrimp, and critters. If you are very lucky there are the Pelagics, Sharks, Rays, even dolphins and Humpback Whales. Conditions are on the whole fantastic. There is invariably somewhere on each island you can hit the water every day. If your current location is wild and wavy, just a short drive somewhere can yield flat calm results. There is So much to love about Hawaii and little to hate. The downside is the heavy rains in mountainous areas, runoff from farm and industry and the churning of the ocean when a storm rolls in can lead to poor Visibility. This can last for a few days after and can ruin certain spots while you are there. There is always somewhere good to hit up though even if that means taking a snorkel tour to get you away from the coast. Let us know your best Snorkeling Tips? Is there anything you do that you swear by? Some obstacle you overcame to become snorkeling god? Or Maybe you are just starting out and have some questions? Just fire away in the Comments below, we would love to hear from you.